Columbus, Ohio rock band BEARTOOTH will release its new studio album, “Disease”, on September 28. The band’s third effort is a stark look inward and the next installment chronicling frontman Caleb Shomo‘s battle with his own demons. 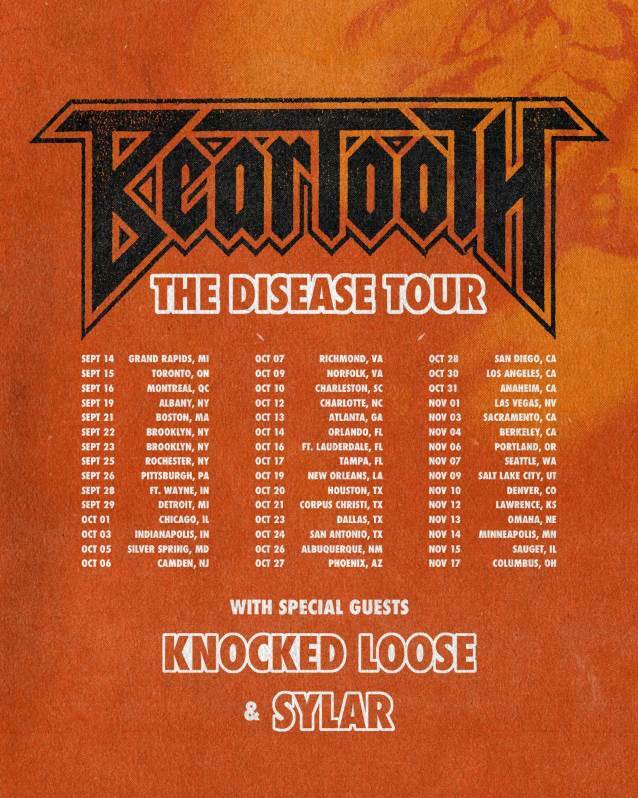 In celebration of “Disease”‘s release, BEARTOOTH will be taking off on a headline tour in the fall. Kicking off on September 14 in Grand Rapids, Michigan, the tour takes the band all across the states and back, wrapping up at Express Live! in their hometown of Columbus on November 17. A special BLABBERMOUTH.NET presale for select shows will begin on Thursday, July 26 at 10:00 a.m. EST and end on Thursday, July 26 at 10:00 p.m. local time. When prompted, type in the presale code “BLABBER” to access tickets before the general public. Tickets go on sale to the general public on Friday, July 27 at 10:00 a.m. local. Nov. 17 – Columbus OH @ Express Live! “Disease” is a painstaking, riff-driven examination of the unshakeable throes of depression. While there are moments of positivity, this isn’t the sound of triumph. This is music about survival. Even as Shomo and his bandmates played to sold-out crowds across Europe, the battle against mental illness and childhood issues returned, and the seed for “Disease” was planted. The title track was the first song written for it, setting the overall tone. To further enhance the emotional realism BEARTOOTH champions, the third full-length album was tracked in a brand new environment, with an old-school urgency. After crafting the songs in his usual basement domain, Shomo made the trip from the familiar comfort of his equipment and isolation in Ohio to Blackbird in Nashville. The famous recording studio was the birthplace of pivotal work from a massive list of legends, tastemakers, and up-and-comers, like ALICE IN CHAINS, Taylor Swift and GRETA VAN FLEET.